‘Sound Awakener’ is the solo project of Nguyen Hong Nhung, but it owes its specific existence to another artist, Irene Cruz. Cruz is a visual artist whose exhibition ‘What Dreams are Made of’ was the conceptual source of this album, created in order to provide a suitable sound dimension to Cruz’s artworks. ‘September Traveler’ is not really a dark ambient album, but it possesses some of the great qualities of this genre. Sound Awakener broadcasts long waves of sound and paints grim paintings with it. However, “September Traveler” does not need any artificially unsettling tactic in order to sound “dark”. Instead – these five tracks have their own eerie and mysterious auras thanks to both the strange, esoteric and even alien music compositions, and a distressing, constant hum that waits like a an underground horror for the right time to reach from under the surface and attack. This never happens in the album, I have to say, but it’s a good thing since as it keeps you on your toes without ever reaching a revelation. The catharsis is somewhere else; in the self tuning you do with the distorted, disfunctioning piano on “The shade you’ve become”, or in the little ghost story of “The call is fading”, ending this album with a brittle swansong. 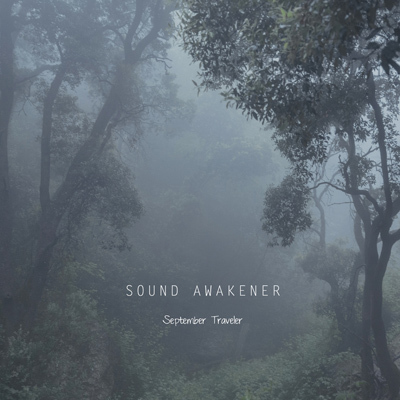 While I haven’t seen Irene Cruz’s exhibition, of which this album was an important part, Sound awakener’s ‘September Traveler’ is a great stand alone album of lucid dreaming and twisted, bittersweet worlds. Very much worth of your listening.